I apologize in advance for the hastily-written nature of this post. I did not intend for this to be today’s entry, but I had to get this content up as quickly as I could. I also apologize in advance to Mr. Billy Collins. To you, sir, I would like to say that should you ever in the future come across this post (A person can dream, can’t he? ), please understand: I had no idea what was going to happen. I was horribly offended, for your sake, and for the sake of poets and poetry everywhere, and did my due indignant diligence. Your poetry is very dear to me. I in no way intended the defamation or defacement that occurred during the event about which I am writing today. I am sure, however, that you have a fantastic sense of humor about such things. A few weeks ago, I became inspired by this article: Poetry has the Power to Inspire, to Foster Community. I also ran across this art project on Stumleupon: “Before I die, I want to ________” street art. I continually thought about these two articles for the next several days. I really wanted to try something like this on my own. I pondered it long and hard, and eventually I decided I would do it; I was going to hang some poetry in a public place and see what would happen. This was my attempt at a little community building project in my apartment building. I hung the paper above my building's mailboxes. I also attached a string and an ink pen so that people could record their thoughts on "The Dead." I was really excited. I couldn’t wait to see what happened. I have always been able to solicit from my students fantastic responses to poetry, and I thought that I might be on to something cool here. I guess one might already be able to tell by the tone in my writing that things did not go the way I believed they would go. Before I write any further, I need to mention a couple of things. First, I live in an affluent area of St. Louis County. Second, I live in a pretty nice apartment complex. The majority of the tenants are families and medical students at Washington University. Thirdly, there are no teenagers or tween-agers living in my particular building. The mailboxes, where I hung the paper, are each located in the buildings with their corresponding apartments. There are only eleven apartments where I attempted this exercise, thus, only eleven mail boxes. I know all of my neighbors (even the new guy *ahem), which is interesting, because it gives me a sneaking suspicion who is the author (*ahem) of the brilliant comments to be displayed momentarily. That is neither here nor there, however, except to reiterate that I do not believe a teenager responded to my poem. I have seen teenagers respond to poetry. I know what teenage thought and writing looks like. I am a high school teacher, after all. Anyway, I thought that the worst that could happen would be that no one would respond to the poem. Days would go by, someone might steal my pen, but Mr. Collins would receive no comments. Perhaps it would be removed by apartment staff for some weird lease agreement violation. All of this information is intended to assist with the illustration of my consternation as I write this post. I taped up the paper at around 11:30 on Sunday night. I was hoping to inspire a little intrigue on Monday morning as the majority of my ambitious, adult, well-educated neighbors headed out the door on their respective ways to work. I went to sleep that night with dancing visions of profound reflections being written down on my humble piece of paper, idea-provoking conversation happening over poetry around my mailbox, and a long, illustrious future of sharing poetry upon a public wall in my place of residence. I had plans the next day to meet up with friends early in the morning so that our kids could play together. I have to admit that during the calamity of waking a two-year-old, feeding her, dressing her, and getting her out the door, I forgot about my activities from the previous evening. Fewer than ten hours after taping the sheet of paper to the wall, I walked downstairs from my apartment, daughter in tow. I glanced at the wall on my way out the door, and behold! There was a flurry of scribbling, all over my piece of paper! I was ecstatic. I rushed over to read the comments. If it was such a waste of time, why did you stand there and write it all? Hey, at least now you are a published writer. I still have no words for this. I immediately took it down. Not so much because I was ashamed, frustrated, or defeated, even though there was a little of those things. No, it was because I didn’t want any of my other neighbors to be subjected to such ridiculousness. I think I am going to try again, after I rethink my approach. I will try a new poem, too. I now see this as a personal vendetta, and I will not give in! checking their email or visiting a website full of them. someone they once were is who they are. Too deep from their slanted shoulder tone. we watch it. I head down stairs through many layers. This poem began on the campus where I teach, at a community college. A lot of my students have shown peaked interest in poetry, or the humanities in general. My early surprise at this revealed I am much more of a bourgeois pig than I thought. I think this poem attempts to articulate some of that. The obvious allusions to Eliot’s “The Waste Land” and Keats’ “Ode to a Nightingale” come from poetic eidolons in my own reading. To break loose from Eliot would be like breaking loose of my house in January, and I have recently returned to “The Waste Land” [after reading an inspirational essay by Mary Karr] with new fervor and fascination for the charges it releases internally when I “switch off.” Don’t analyze. It dances. So, I think this poem expresses some of the tension between the high-brow perception of poetry and poets, a perception somewhat fostered by Modernist views, and the tender experience of living in a poem. After a little bit, I’ve settled on the fact that I will most likely continue revision, as most poems in fact help to revise us, while still enjoying it as it now sounds. I often struggle with feeling frustrated or discouraged over things. It has been a major force in my life, driving my decisions to either do or not do many things. Most of the time it comes in the form making a comparison between me and others, and always directing the positive light away from myself. In a fashion this could be a good issue to have, as it does often result in compassion or humility. More frequently, however, it is a form of anti-pride, and pride has always been a problem for me. Take my writing, for example. I really do enjoy writing. I enjoy the feeling of writing something that I know is my best work yet. I am entertained by the act of putting words to paper, permanently affixing my thoughts to a point in history and space. I thrive on the use of language, and find it pleasurable to search for exactly the perfect word. One would think it should be enough for me, writing for writing’s sake. Too many times, though, I wish to receive approval from others, and I want to impress people with what I have produced. This is where I begin to have problems. I am blessed with friends and acquaintances who have significant gifts in the arts, be it the visual arts, music, or writing. At times, most commonly when I get into a discussion with these friends about the concepts of writing and creativity, I find that my ideas are divergent from many of theirs. Typically this should become a situation where people could agree to disagree. It isn’t that simple for me. I will, in many cases, come to believe that their ideas are somehow quantifiable as greater or of more merit than my own. I go to them hoping for praise, but I sometimes leave feeling scorned or mocked. I know this is merely my perception, that I have built an entire alternate reality out of assumptions and neuroses. I discover that I have numerous insecurities. I feel as if I am missing something when it comes to what I do, lacking a formal education in creative writing and poetry. I often feel as if I am of a lesser caliber than my peers. The junkyard dog of self-doubt and discouragement will bite into the pit of my stomach. It will hang as dead weight, jaws locked securely, for days. I begin to see and focus upon (what I perceive to be) my shortcomings. These thoughts will consume me, spirit and mind. This cycle typically results in my relenting from an endeavor about which I had once been passionate, leaving it for one of my more capable and worthy companions to succeed. I also know that I react to things first on an emotional level. In a lot of ways this serves me as a strength. It allows me to connect to my students. It is a quality that helps me navigate the territories of marriage. In many instances it fuels my thoughts when I write. So, why am I writing about this? It is because I am currently experiencing a period of self-doubt. It is what is foremost on my mind. Presently, it is the only subject about which I can think to write. I suppose by writing about it I can somehow turn it against itself, a Judo maneuver of the psyche. Perhaps by offering it up as matter for discourse, I can encourage others whom may be feeling the same thing, to discourage the types of thoughts with which I so often struggle: everyone “gets it,” but by some cosmic oversight I, in fact, do not. I never will, and in this I am alone. Try as I might, I will not ascend the steps of enlightenment. Sounds ridiculous, right? In all sincerity, these are thoughts that frequently slither into my mentality and almost entirely paralyze me. I present it here. I consider “writer” to be a part of who I am. I sincerely and wholly enjoy the act of writing. I struggle, however, with fear, with insecurity, and with warped thoughts. I know, in my head, that this is my imperfection, not my ability or lack thereof to translate thoughts into crafted words and punctuation (though there are, and always will be, some issues with my writing from a craftsman’s perspective. Otherwise, why continue?). I still struggle with it, though. Perhaps I always will. Perhaps, if anything, this might become a word of encouragement for someone experiencing the same problems. I hope that by confessing, I might be freed. I pray that in the future I have a victory about which to write. I apologize if today’s thoughts were a downer. Maybe I can lighten the mood with some items of procedure. If I could ask a favor from those who read my blog regularly, and you enjoy what you find here, I would like to ask that you please spread the word. So far, Facebook has been the primary source of my traffic. That being said, it would mean a lot to me if you would re-post or share updates about Poor Scribbler. Refer your friends. Follow me on Twitter. I can use all the assistance I am offered. I would also be appreciative of any feedback or suggestions from readers. Any at all, be it about my writing, the website itself, or ideas for features and content. Thanks in advance, and thanks presently to all who read my stuff. It is exciting to know that there are people who stop by my page. It’s similar to the feeling I used to get before Christmas or Easter. Pretty cool. Thank you for stopping by this week. Come back on Tuesday! Today I would like to share another one of my poems. This one is older than “The Afternoon Nap.” I began this poem in the summer of 2009 as an assignment while I participated in the Missouri Writing Project, the University of Missouri – Columbia’s branch of the National Writing Project. In this poem I was attempting to create imagery. I wanted to vividly describe the brewer, the painter, the monk, and the father as they each engaged in a respective task. I also mean for each of the four characters to be conceptual rather than representative of any actual person. While the idea of each character is meant to be vague, the image associated with each is meant to be distinct. By doing this I hoped to create four different perspectives on the same idea: what it means to participate in something larger than one’s self. I have, in the past, chased after things in which my chiefest concern was my own success. When I started college, my primary objective was to stand out from my class mates, no matter what it took to do so. When I took on a task at work, my goal was to gain recognition from my boss. When I entered my master’s degree program, I intended to give myself an advantage over my colleagues. None of these motivations may seem inappropriate, but in the end my values were in only one place: me. I realized how self-serving my life had become. I was warping the things I had been given. I discovered why my work had come to feel so meaningless, why I no longer felt joy in doing the things I was doing. Ultimately, I was spending all of my time and effort, all of my strength and ability, to build up something that would not last. I remembered that I will not live forever, which made it meaningless for me to invest primarily in myself. I understood that I was not born to be successful, to be followed, or to be “happy.” I was born to be a servant. I had bought in to the concepts of “rights” and “independence” that are so popular in our culture. In chasing after those things I actually became enslaved to the pursuit of them. In the end, I wrote this poem about what I think it means to surrender to something bigger than ourselves, to live for something beyond our own successes or failures, beyond the scope of our allotted time in this version of the world. When we create, we recognize that we are in need of something more. Our desire to make art shows that we understand there is something missing, and that what already exists in this life is not good enough to complete us. I am not saying that what we create with the work of our hands is enough to make us whole; I am saying that the desire to create is a symptom of our being incomplete. As I have written previously, we become lost, so God whispers to us to guide us home. Because His words are beautiful, we become inspired. When we become inspired, we create. Art is the reflection of God in us. that it might have known him. an echo of contented life. Today I have another poem to share with you. I have only recently written this one, and it is the first poem I am posting that I do not consider to be finished. My goal today is to see if anyone would offer me some feedback on this draft. As with most of my poetry, I am primarily concerned with imagery. I enjoy rural scenery and the outdoors in general (contradictory, seeing as I am writing a twice-weekly blog…), especially early in the morning. I teach in what is considered to be a rural community, though recently it has rapidly expanded and is very much suburban. However, on the edges of the town there still exists some farmland and undeveloped property. I have the pleasure of driving through this part of the community every morning on my way to work. This poem is about a frequently-recurring fantasy I have. I most commonly have this fantasy in the Spring. When I pass by a fenced-in pasture, I often want to get out of the car, hop into the field, and start walking. I often wonder if the farmers who own the property ever do this, with the exception of hopping out of the car as they happen pass by. I’m sure they do; my students are full of stories about running around on their parents’ or their grandparents’ property. I have to admit: it makes me slightly envious. My goal with this piece is to illustrate the pasture and the morning, and, hopefully, my obsession with this type of scene. I also intend to capture a bit of the contradiction between “having places to be” and wanting to be nowhere in particular. I also wish to comment on the frustration that comes from the fact that I most often see these pastures and fields, and therefore most often have this daydream, as I am on my way to work in the morning. Enjoy the poem. Please keep in mind that this is not yet completely finished, though I do consider it to be in “the final stages.” I would appreciate your feedback. Half-heartedly guarding the perimeter of a pasture. The kind that cast long shadows in the early morning light. The short cut on my way to work. Beyond the reach of morning’s commute. Leaving the door hanging open as I walk away. Then stand a moment, leaning against one of the chilled metal posts. And step softly into the gravel on the other side. As if all along Eden had been hidden in Missouri. Leaving behind a trail of yarn I would not follow back. Set somewhere beyond view of the highway. Just before it vanishes into the sunrise. I believe that God speaks to us all. I believe that God fiercely desires us and fiercely loves us. I think we often forget this, or never learn it in the first place, because there is much suffering in the world. The suffering distracts us, and we become lost in shadow. We try to find our own way out of the darkness, but because we as humans are so limited we inevitably trek deeper into the gloom. Because of this, our Father places things and people into our lives that are singularly purposed to remind us of Him. They are glimpses of light in a dark world; they are beacons meant to lead us away from darkness, to guide us back home. Typically these are those things that move us beyond our capacity to name or fully comprehend the feelings they stir. Once we begin to respond to and follow these signals, we begin to see that God is in everything, and the world becomes much less dark. For me, this is where art comes from: seeing what the light of Heaven is illuminating. The day my daughter was born was the day I realized God wanted my attention. This was the first time in my life, I think, that I “truly” began to write. I tried to write before, to create music, to draw, but I always did it selfishly. I wanted people to be amazed at my profound abilities. I wrote about what I thought people would think was “deep.” I wanted to be recognized for being talented. I was trying to find my own way out of the shadows. Then, God revealed to me what it actually means to create. When I held my daughter for the first time, and as I got to know her for the first few weeks of her life, God began to open up entire cosmos in my soul. Every time I looked at her, I felt spiritual atoms splitting. The inspiration to write, for me, comes from God revealing his presence in small, but confounding, ways. Through my daughter I get glimpses of Heaven, and I get to experience a fraction of the love that my creator has for me. When I experience these moments, I write. Enjoy the video. The music was written and recorded by some very good friends of mine, Blackbird Cathedral. It’s National Poetry Month, so today I have decided to put up some things I would like to share with you. Today’s post is a bit long, but I hope it will be worthwhile. To begin with, I would like to recommend a few poets and books of poetry you should check out. The first is my absolute favorite collection of poetry, Sailing Alone Around the Room by Billy Collins. This a great introduction to poetry. If you have struggled with poetry in the past, this is the book for you. Billy Collins has a way of starting out a poem in a way that is light and humorous, often times irreverent, and by the end of the poem turning the tone around on the reader, plunging suddenly into sorrow, beauty, and, yes, even love. Sailing Alone Around the Room is a collection of poems from Collins’s previous volumes, sort of a “best of,” if you will. I highly recommend this book for someone who is dabbling with poetry as either a reader or a writer. To see the man in action follow this link. He has also just released a new book, Horoscopes for the Dead (Make sure to read the news story below). 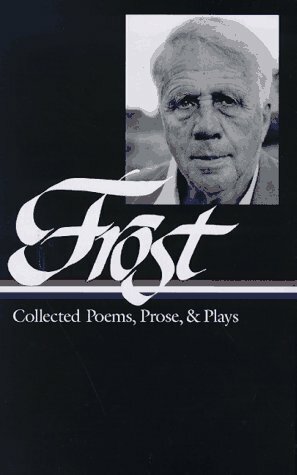 Another book I really appreciate is Frost: Collected Poems, Prose, & Plays. This is a general collection of the works of the late Robert Frost, who is famous for the poems “The Road Not Taken,” and “Stopping by Woods on a Snowy Evening,” two of the most celebrated poems in the American canon. Robert Frost is probably a poet you have heard from before, whether you realize it or not. 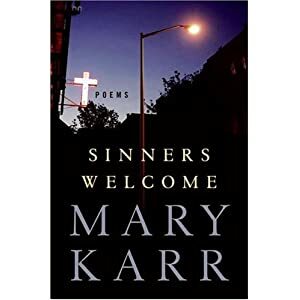 One final book I would like to recommend is Sinners Welcome by Mary Karr. This book may be for the less-novice poetry fan, but I don’t think it is terribly dense linguistically. What it is thick with is imagery and commentary on faith, and beautifully, beautifully expressed reflections on growing up, making mistakes, and finding Grace. My favorite poem from the book is titled “Disgraceland,” and I can barely get through the last three stanzas without tearing up. A good friend of mine loaned me this book, and it took me a while…most of a year…to return it. Thanks, Andy. The English teacher in me couldn’t resist putting up this link. It makes sense to me that learning short, repetitive verses would help foster in children’s minds patterns for sounds and the feel of language. My daughter’s favorite books, the ones she chooses for herself, are typically the ones that she can “recite” along with us. Typically these are the ones that are written in some form of verse. This is why I appreciate this man so very, very much. He has worked to grow an awareness and appreciation of poetry in America. He used his post as Poet Laureate to promote poetry and literacy programs in public schools and libraries across the U. S. I cannot wait to get his new book, Horoscopes for the Dead. Okay, I’m done cramming things into this post. I’ll finish up with a few housekeeping items. I am working on adding a “submissions” page to the site. It would be a place for anyone who would like to contribute something to Poor Scribbler to submit their writing. More to come. As always, I am looking for feedback on the page. If there is something you would like to see or something you would like me to write about, please let me know. If you have any complaints about the site, I want to know that, too. I really want this to be a place to come enjoy, so I need to hear from you! Sign up, comment, and enjoy! Lastly, thank you to everyone who has helped to make my first week doing this a successful one. I’ve had a lot of traffic, and it humbles me to no end. Thank you. It has been uplifting. See you on Tuesday. Blessings.